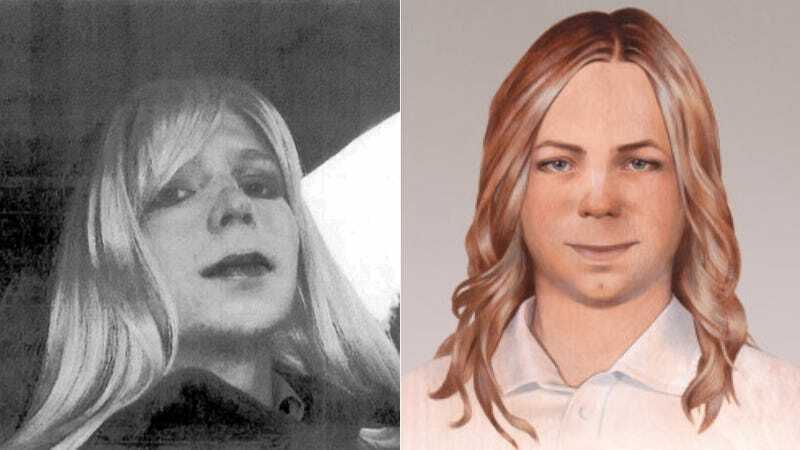 On Wednesday, Chelsea Manning revealed that her name has been legally changed to Chelsea Elizabeth Manning and expounded on the significance of the moment for her. In a post published first on her website and then republished on the Huffington Post, Manning called today an "exciting day," writing that she's chosen to change her name for a simple reason: "because it's a far better, richer, and more honest reflection of who I am and always have been –a woman named Chelsea." She also shared an artist's rendering (seen above) of how she "sees herself." Though Manning announced that she identifies as a woman back in August, this legal pronouncement by a court in Kansas allows her access to the healthcare she needs in prison (like hormone treatment) to transition appropriately. Manning is now in the process of waiting for the military to reveal what care, if any, they will make available to her.